BM PVC windows are made from 100% pure compound, environmentally friendly and that adapts to the worst weather conditions such as ; sun, rain wind, snow and salted air. 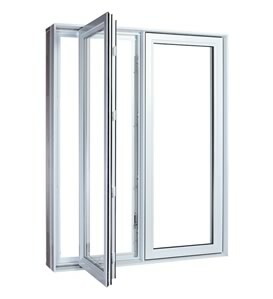 ON THE PLAN OF THERMAL EFFICIENCY, THESE WINDOWS SATISFIES THE HIGHEST STANDARDS OF THE INDUSTRY. WICH RÉSULTS IN SAVINGS OF THE COST OF HEATING AND AIR CONDITIONING, WITHOUT ANY SACRIFICE ON THE COMFORT. The multichamber structure of the profiles garantees the intergrity and the solidity of the window seasons after seasons, years after years. Résults of a unique technology to Portes et Fenêtres BM, it assures a remarquable heat and sound isolation , which leads to saving on energy and a better quality of life. The corners welded by fusion contributes to eleminate air and water infiltration. .
Their design allows to take maximum advantage of the view and the light. The bevel of the shutter gives a remarquable aesthetic. The PVC frames of superior quality are partically maintenance-free. It only requires to wash them occasionnaly with a dampt cloth. No need to paint or dye. The windows keep their impeccable appearance for lifetime. The opening mecanism and the multipoint high security locking systeme are solidly and permanently fixed in their securing unit. The exclusive screws are specially conceived for PVC.The screws goes through at least two partitions for greater stability.